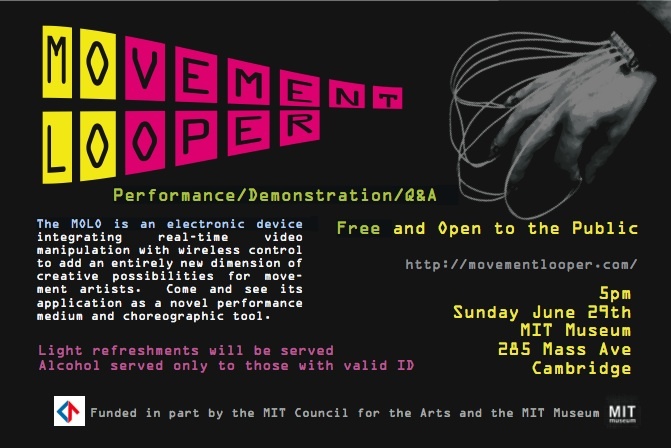 The Movement LOoper (MOLO) is an electronic system that integrates real-time video manipulation with wireless control to add an entirely new dimension of creative possibilities for movement artists. 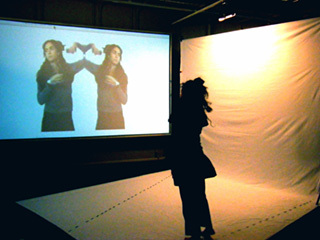 It can be used both as a novel performance medium and choreographic tool. Many technological tools have been developed for musicians; for example, they can record a phrase of music live and then play it back in a loop. The musician can then apply various effects on the playback in real time and combine it with additional live sounds, creating a uniquely evolving musical performance. Music composers also have many means of experimentation in the studio, enabling them to audition compositional phrases or orchestration of multiple instruments. The MOLO allows for similar sampling, looping and playback using movement as the medium. The visual nature of the playback adds an additional level of complexity because it is necessary to manipulate both time and space. The MOLO is intended for any size space from a small room up to a large stage. A camera is aimed at a particular region for movement acquisition. A projector is located behind the screen or overhead to minimize occlusion from the live performers. 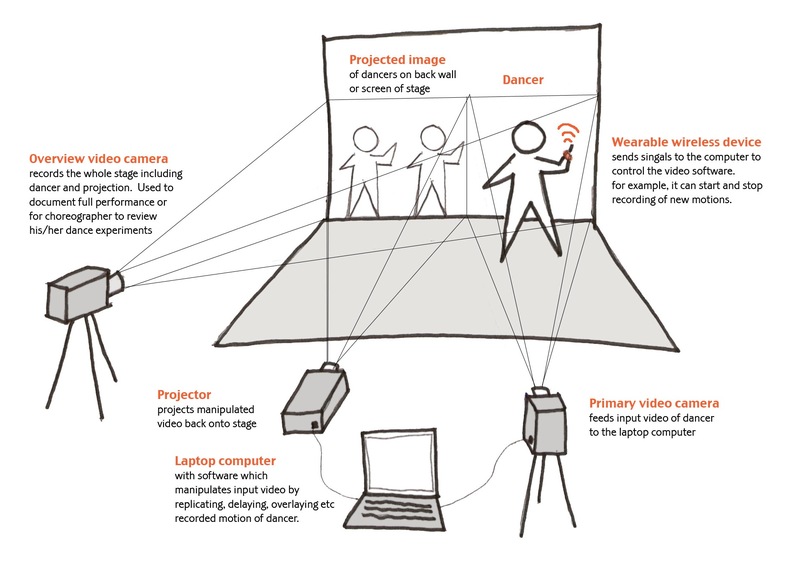 The cameras and projectors are connected to a computer with multiple displays and capture cards, providing hardware acceleration for both input and output. The interface by which the performer communicates with the system is critical because it must not hinder the movement of the dancer. We have built a lightweight wireless hand-worn device allowing basic finger motions to perform tasks such as turning on and off the motion acquisition, playback of one or more captured loops, and selecting various effects and modulations of the clips. The visualization of dancers performing movement can be extremely difficult, particularly when several dancers and complex ensemble effects are involved. The MOLO allows a choreographer to sketch out choreographic ideas and instantly see the results. Choreography is inherently an iterative process and the MOLO could potentially enable the choreographer to produce a more highly developed piece. Furthermore, the extremely fast turn-around time between the invention of the movement and the execution and visualization of the movement will transform the choreographic process. The real-time nature of the MOLO gives it an immediacy that will allow a choreographer to harness improvisation more readily into their work. Additionally, an artist who wants to work in the medium of choreographed movement is often extremely limited by the dancers they are able to find to work with. Not only must the choreographer find dancers that are able to perform the piece on a technical level, the dancers must also have the time to learn and rehearse the piece. With the MOLO just one dancer can mimic the effect of having tens, even hundreds of dancers on stage who do exactly what the choreographer dictates. They can even have perfect (or perfectly imperfect) synchronicity. We hope that the facility with which this system is able to create repetitive movement will open up new creative avenues for choreography. Just as the repetitive riffs of certain kinds of music are most easily executed electronically for technical reasons, repetitive movement could also be more easily carried out electronically. The MOLO will allow for the creation of a complex movement texture that is unprecedented. Additionally, all acquired video clips are saved to the computer for the choreographer to refer to at a later time. It would also be entirely possible for the choreographer to acquire motion performed by others and use the movement clips as starting material for choreographic composition. The additive nature of the MOLO allows the choreographer to explore relationships between movements. The element of chance and the ease of experimentation can lead to unintentional and unexpected movement combinations that the choreographer might not have noticed otherwise. Cardone's performances have been said to "release form from the unconscious heart into the conscious mind" and "to occupy time while suspending it." Her work has manifested on both stage and street, in solo and group compositions, in dance films and concentrate on interdisciplinary collaborations with Kinodance. Cardone trained with Min Tanaka (Body Weather Farm), has collaborated and performed with Paula Josa-Jones/Performance Works, Nora Chipaumire, Elaine Summers & Yoshito Ohno and continues to study and perform for 'Nijinski of Butoh' Akira Kasai, most recently in "Butoh America" a centennial commission by Japan Society for the New York Butoh Festival (October 2007). In Japan she was featured in Kasai's "Nobody Eve" (Tokyo & Kyoto, 2003) and in 2004 received a fellowship from Asian Cultural Council to train with Kasai, study Nihon Buyo with Minosuke Nishikawa and collaborate with contemporary dancer Naoka Uemura on the multi-media production "Wonder Girl" (Tokyo, 2004). Cardone has collaborated and improvised with musicians such as Masakatsu Takagi, rock guitarist Chris Brokaw, Tatsuya Nakatani, Greg Kelley, Mike Bullock and noise artist Jessica Rylan. Currently on faculty at Longy School of Music's Dalcroze Eurythmics Program, Cardone has guest taught at Concord Academy, Boston Ballet, Drop Dance Collective (Boise, ID), Soundscape (N. Carolina), Bank America Celebrity Series & has led Butoh-based improvisation labs in Boston, Russia & Philadelphia. 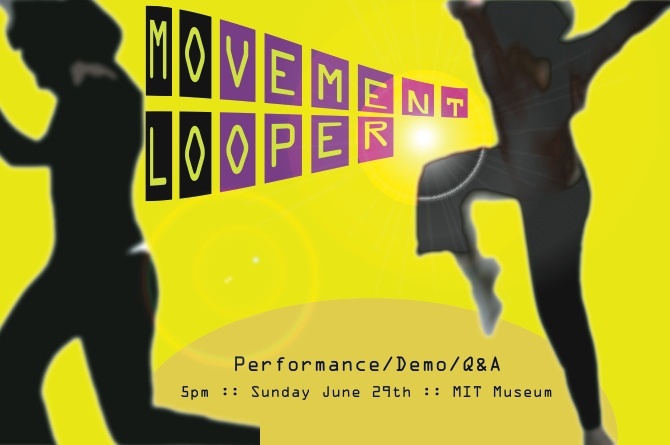 Suelin Chen (suelin@mit.edu) was trained in ballet and classical Chinese dance but has experimented with other genres as a member of the Othila dance company, Ridonkulous, MIT Dance Troupe, and MIT Bhangra; as a dancer she has opened for Naughty by Nature, Fabolous, and the Boston Celtics. She minored in music theory and composition and is fascinated by the relationships between music/movement and technology/composition. 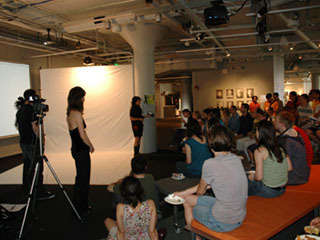 Her varied experience includes being a List Visual Arts Center intern, MIT Arts Scholar, Emerson Music Scholar, production assistant for the Jamaica Plain Open Studios, docent at the DeCordova Museum and Sculpture Park, and she currently sits as the student member on the List Visual Arts Center Advisory Committee. She was a recent recipient of the Laya and Jerome B. Wiesner Student Art Award for Music, Dance, Writing, and the Visual Arts. Suelin spent a year in France where she studied engineering, taught hip hop dance classes and founded a dance company that competed nationally. This summer she is returning to Paris to co-curate an exhibition at Le Laboratoire, a new creative space for science and art collaborations. She is currently pursuing a PhD in the Department of Materials Science and Engineering at MIT. 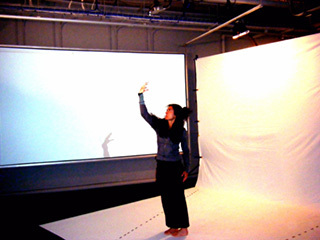 Tilke Judd's (tjudd@mit.edu) interest in the arts lies in dance and video. She was a competitive ballroom and Latin dancer on the MIT and Cambridge University Ballroom Dance Teams for 5 years and enjoys dancing Salsa and Argentine Tango socially. Her video interests stem from her UROP at the Media lab as an undergraduate and since then she has created a 15-minute documentary for the MIT-China program, interned with independent filmmaker Elizabeth Canner, and submitted award winning 5-minute videos for the Campus Movie Fest competition with her team The Procrastinators for the last three years. She is a frequent attendee of the Grad Arts Forums and presented her video work at a forum this past fall. She is pursuing a PhD in Computer Graphics with Professor Fredo Durand in the Department of Electrical Engineering and Computer Science. Mat Laibowitz (mat@mit.edu) is a PhD student at the MIT Media Lab. His research at the Lab has usually been concerned with the use of human- centric sensors in media such as music, film, and interactive art. 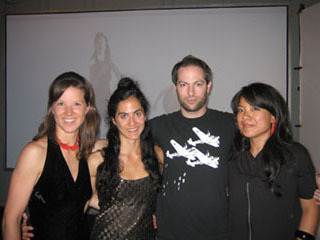 His very first project at the Media Lab was to create an interactive music piece with shoe-mounted sensors reacting to a dancer's movements. This piece was performed at the Brandeis Theater. As an artist, Mat Laibowitz has shown work at Exit Art in NYC, Fellisimo House of Design in NYC, The Longhouse Sculpture Reservation in Easthampton, NY, Eyebeam Gallery in NYC, The MIT Museum, The McGill University Gallery, and at the International Contemporary Furniture Fair. As a musician he has performed at the Limelight and at South by Southwest.